Speaking of pet peeves (see Carl’s recent ep-ology blog posting), one of mine is the frequent implication in news articles that a certain chemical is dangerous because it is used either in dangerous settings, has dangerous applications, or is an ingredient in another chemical that is hazardous to health. This is a common tactic used by journalists, lobbyist groups, and even governments when trying to incite public fear about something. Of course, simply associating something with a dangerous or hazardous material does not mean that the chemical itself is hazardous. The rule of thumb is that the dose makes the poison, and so by that understanding, everything can be toxic at some level; it’s really only the amount of something that matters. People are primed nowadays to fear chemicals, and anything that sounds foreign or unnatural (known as chemophobia). However, everything we touch, see, and smell is made up of chemicals, and anything reduced to its chemical name can sound sinister when presented in the right context and to people who are unfamiliar with chemistry. Probably the best example of this is the famous dihydrogen monoxide hoax, where students ran a mock petition to get rid of water by using its chemical name and indicating all the terrible things it is associated with (for example, that it can cause drownings, floods, and is used as an industrial solvent and coolant). Also check out the American Council on Science and Health’s turkey dinner ingredient list (in the spirit of the turkey-eating season being upon us) for more sinister-sounding, but perfectly-fine-to-ingest chemicals. Unfortunately, journalists and lobbyist groups use this ignorance to their advantage when they want to demonize something. 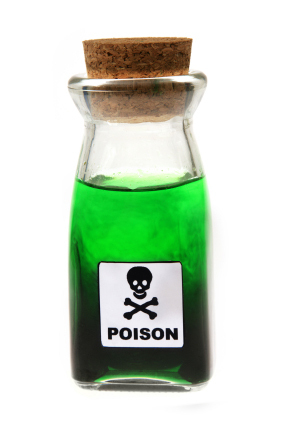 By stating that something is associated with a hazardous chemical, they imply that it, too, is hazardous. (Perhaps we can call this “science by implication”.) This not only takes advantage of chemophobia to create fear, but perpetuates ignorance and scientific illiteracy with respect to our environment. Readers of this blog will be all too familiar with this tactic, in the example of propylene glycol. Any article that wants to portray e-cigarettes as negative manages to neatly fit in a statement about propylene glycol being an ingredient in antifreeze. Of course, just because propylene glycol (or any other chemical) may have anti-freezing properties does not make it dangerous, and considering how ubiquitous propylene glycol is, fears regarding it are mostly unfounded. It is safely used in theatrical fog and asthma inhalers and many other products (like lotions and toothpaste), and has received a GRAS (Generally Recognized as Safe) rating from the FDA. Dr. Josh Bloom of the American Council on Science and Health recently put it quite well when talking about perchlorate, and how news articles insist on referring to it as an ingredient in rocket fuel and explosives: “What perchlorate is used to manufacture is irrelevant… Such a descriptor is completely misleading and is only referenced to horrify the reader.” Indeed. And imagine if the opposite occurred? No group will ever start promoting the safety of cyanide due only to its presence in lima beans, spinach, and soy. Another type of illiteracy is legal interpretation. I have twice in the past day or so seen the observation that the court decision means that the e-cigarette should be regulated exactly like a tobacco cigarette. Not true. The court decision cited the definition of tobacco product from the Tobacco Act, which includes any product “derived from tobacco.” The nicotine in an e-cigarette comes from tobacco, hence the products may be regulated under the Tobacco Act, which has different requirements for different types of products. E-cigarettes are not mentioned. Because e-cigarettes are not real cigarettes and are not combustable, it would make no sense to try to apply tobacco cigarette regulations to e-cigarettes. It will be necessary for the FDA to promulgate new reulations that take into account the design and true nature of the product.